And they said you couldn't move mountains... Oh ye of little faith! 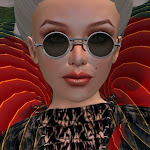 Physics and now Land artist Selavy Oh has created a script that operates the terraforming capabilities in Second Life®, resulting in the continuous and automated reshaping of land, even without her presence. To my knowledge, this is without precedent. That's me filming in the center of the mountain peaks. Selavy was not even in-world for that portion of the taping! Terraforming, the ability to intentionally transform surface topography, atmosphere, temperature or ecology, is not unique to science fiction or even science (where it is primarily called planetary engineering). In his book, The Making of Second Life, Hamlet Au (aka Wagner James Au), explained the in-world terraforming process quite poetically: "Standing on a hill like a demi-urge, a Resident can wave her hand and cause the ground to swell, expand, or even collapse into the sea." In Second Life, terraforming land is a skill that looks easy to do, but frequently results in unrealistic and poor duplicates of mountains, lakes and canyons. 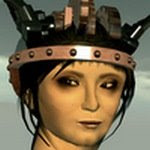 Selavy, who rezzed in February of 2007, is most widely recognized for her physics work with the most basic of prims: the humble but noble cube. She has expanded her range considerably in the past few months and now works with any number of shapes and even Alpha textures, but physics are always involved. Art historian Amy Wilson once compared Selavy to Rauschenberg, explaining that, "I can’t help but think she’s the Rauschenberg of SL, albeit one whose hands are much, much tidier than his ever were (makes sense for the environment we’re talking about). Navigating in this little space created by artists whose work is pure abstraction (DanCoyote, Juria) and artists whose work specifically references real life (Cheen, Nebulosus), she comes to find some very fertile ground indeed." Given recent developments with Comet Morigi's terraforming explorations and her anchoring of huge prims to sims - thereby extensively and surprisingly expanding the canvas - and now Selavy's epic work - many of the most exciting innovations in virtual worlds at this time have to do with Land Art so extreme that I can't help but wonder what James Turell and Micheal Heizer would think. Possibly the closest reference to Dancing Mountains in Real Life might be Heizer's 1971 Double Negative project in Nevada, for which he removed 240,000 tons of stone to make two slices 30 ft wide by 50 ft deep on opposing sides of an existing canyon to suggest a line between the canyon walls. His focus was on the removal of something, thereby creating a Land Art piece that stressed space, rather than an object. But I have no Real Life reference for land that wiggles, shrinks and grows, with no attending human, in an automated fashion. Selavy accomplishes this by leaving her scripts with Negative Overland, a bot that is hidden underwater. Some years ago, I was traveling in the rain forest in the heart of Costa Rica. My traveling companion and I had just sat down to a white tablecloth dinner at a lodge perched a top a mountain less than two miles opposite the Arenal volcano. The volcano was erupting (and still is to this day). Constantly. With a surprisingly loud and deep rumble, the mountain would cough up the fiery lava and rocks, dressing itself in a never-ending kinetic skirt of thick veins in an orangey red. We struck up a conversation with the couple sitting at the table next to us. They were vulcanologists from Finland and they spoke about volcanoes the way we talk about virtual worlds. The woman shared how she got a kick out of hugging active volcanoes at the base and putting her ear up to them. She swore they sounded like the loudest heartbeat on earth. That certainly had a lasting impression on me. For some reason, it was the first thing I thought of when Selavy teleported me in to watch a proof-of-concept demo of Dancing Mountains. She has managed to breathe life into the landscape in ways heretofore unimaginable. Dancing Mountains can be experienced on arts patron Mab MacMoragh's Soup sim by teleporting directly from here. In addition, Selavy nearly always has an installation at Brooklyn is Watching. Teleport directly from here. Early as I wandered around SL I came across saijo (i think it was called), a downbeat cyberpunk sim that I'm told was terraformed using scripted mortars to erode the land into it's final form. Such things are wonderous. Unfortunately we seldom see scripted land as art, as it is so disruptive to other uses of the sim. It really must stand on it's own and is very difficult to integrate with other builds (as the land is wont to push prims around and such.) Like Christo wrapping his buildings, half the art is in securing a place to practice (and dealing with the public indemnity issues) of working on such a large scale. It will be interesting to see how this experiment unfolds over time. thank you, pavig, for your comment. and bettina for blogging! the scripting language command for terraforming has been around for a long time, so it's no surprise that it is used. in fact, i wanted to do a piece using this function for more than a year, but had to wait for a good occasion, which mab macmoragh now provided. the point was not that i did the first scripted terraforming in sl, but that bettina and i never saw it being used for art. it's like in real life: everyone could dig a hole in the ground, but it took a long long time until it was considered as being an artform. What *has* Nomasha Syaka been up to?